On behalf of Saint Joseph Church, we welcome you! We want you to feel comfortable with our nursery so that you will be able to relax and participate at Sunday Mass. We hope to inform our parents about how the nursery is organized, provide some general guidelines and discuss nursery limitations. The nursery is located downstairs next to Marist Hall. It is offered for children from ages 9 months through 3 years during the 9:00 AM and 10:45 AM Sunday Masses. The nursery is staffed by our nursery coordinator along with background checked parent volunteers. If you are available to work the nursery, please sign-up on the nursery volunteer sheet outside of the nursery. Please use disposable diapers at church. Label your child's belongings (diaper bags, bottles, cups, pacifiers, coats, blankets, etc.). Please pack a change of clothes for accidents. When you pick up your child - please wait for the nursery worker to hand them to you, please do not enter the nursery room. Try to be as prompt as possible when picking up your child. 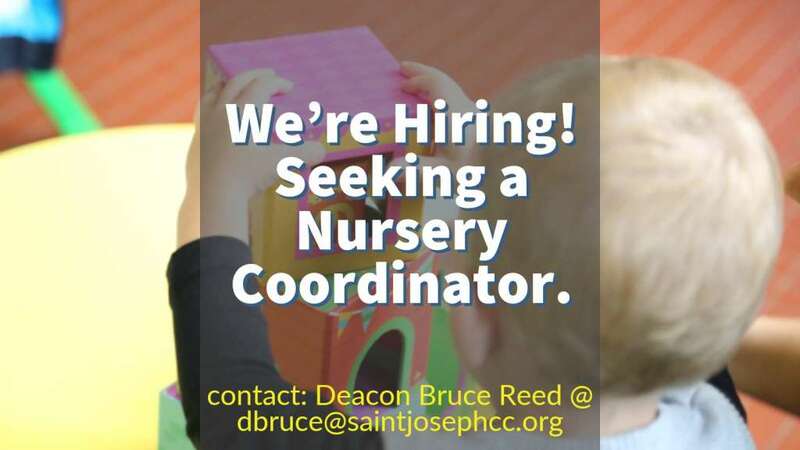 Get to know your nursery workers, they have young children also and are part of your church family! When you sign-in your child at the nursery, you will be given an ID tag. One tag will stay with your child, one is for you to present to the staff when picking up your child and one will go on your child's diaper bag or belongings. If you are ever needed while your child is in the nursery, a church usher will walk through the church with this tag to find you. Please keep an eye out for the ushers, just in case. We also can page you on your cell phone set to silent mode. any unexplained rash or skin infection such as ringworm, impetigo, or pink eye. Be consistent in your church attendance, your child will learn that the church nursery is a fun place to be if they come weekly! Do not be discouraged - crying is normal!!! Most of the time the crying does not last long. Reassure your child that you will be back. Prepare your toddlers before you come to church. Remind your child they are going to have fun playing with toys and their friends. The nursery staff cares about you and your child. Never be afraid to ask questions and make suggestions. After all, you are the parent.